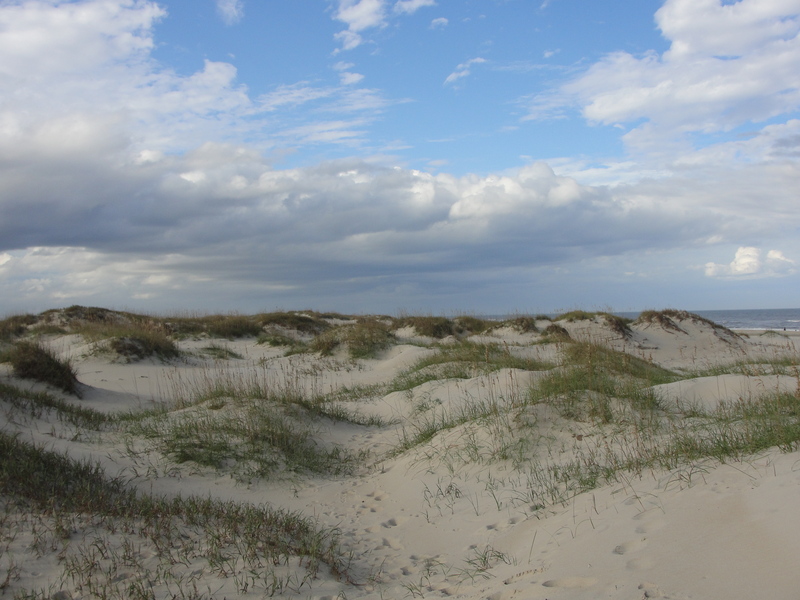 When I was a kid my Granddad took me on a little aluminium boat to an overgrown island where we tracked the wild horses of Currituck, North Carolina. It was incredible. We got to see a foal just yards away, and I was totally amazed. They seemed so majestic out there with no fences, totally free. I never forgot that experience. So when I got the opportunity to work as the writer on an advertising campaign for North Carolina tourism, that memory kept inching its way back up. It was something personal that became work. Memories that morphed into words. I think often the best, most authentic work is personal. I was around horses before I can even remember. 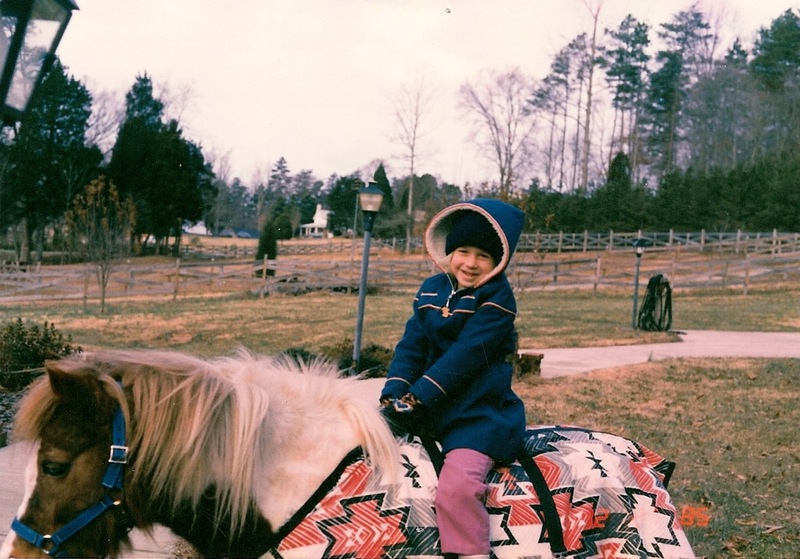 As a little girl I had my own pony, Patches, who gave me some of the happiest and most heartbreaking moments of my life. There’s just something about a horse. All you have to do stand near them, and you can feel the power and emotion. Two souls become one. Telling the story of North Carolina’s wild horses was important for me because it’s one of the most unique and memorable adventures found here. I just had to share it. So as it turns out, we got the opportunity. 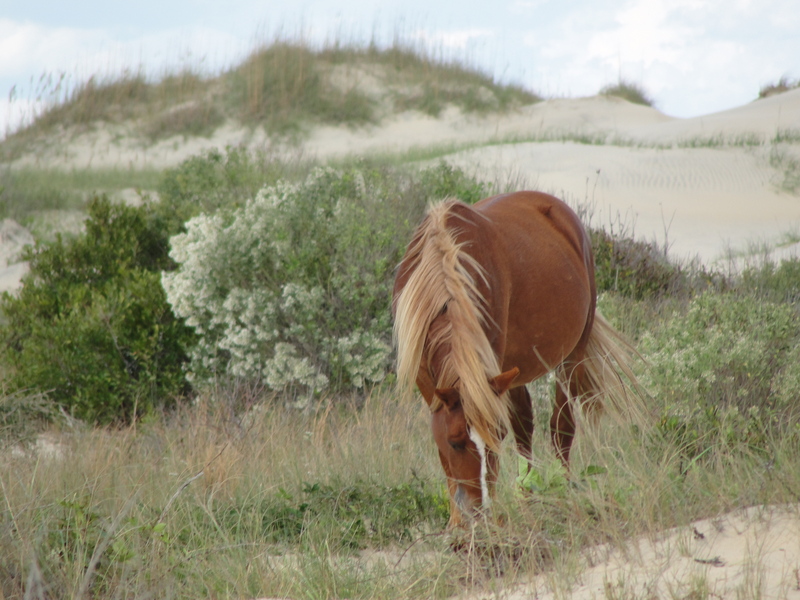 And I got to follow along with a world renowned photographer and the herd manager as we tracked the wild horses of Corolla. Wow. Lucky me. Now two incredible, unforgettable experiences. I saw many horses this time. Some were more hidden in the fields while others walked alongside tourists on the beach. Though flowing freely, their sun-kissed mane almost looked styled. With confidence founded in freedom, they seemed unshakable and often looked right at me. Right into me. I even had my own once in a liftime moment when a stallion climbed down from the top of a sand dune to whisper something in my ear. While I tried to respect the 50 foot distance rule, apparently he hadn’t read the brochure. And what he had to say was pretty important. But that’s all I can say. Like most animals I’ve ever known, their eyes were deep and soulful. Pulling you in with every glance and head toss. The massive and rolling sand dunes felt like I was on another planet while the ocean grounded me. Everywhere I looked, there was gold. Golden light that cast a halo behind their fuzzy coat. Golden oats in the fields. Golden sand beneath my feet. It was magical. They were free, but I was captured. So of course I took lots of photos and put them together in the short video below. 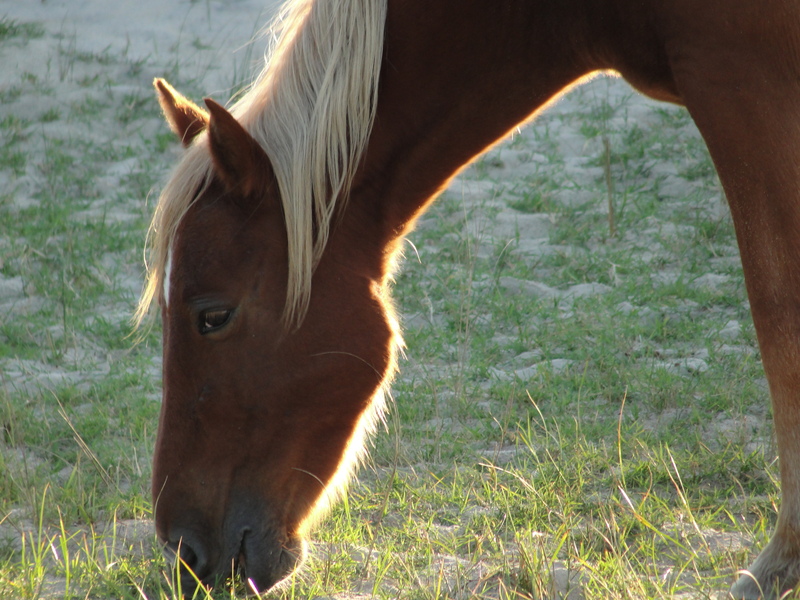 Wild Horses of NC from Margaret Bond on Vimeo. Many of these photos I took looking over the shoulder of one of the best (and nicest) photographers in the world while several others were only seen by me. And now – you. And what more can I say but WOW!!!!!!!! Ah – thanks Sallie. It was an amazing experience to be a part of. Magnificent!! What a wonderful story, pictures and daughter!! You are also an amazing writer, by the way! Thanks Clare. They were really amazing. So – I had great material to work with. Thanks Margaret. We are blessed to have the parents and Grandparents we have. Very true. We sure are. Thanks for reading it and sharing it! Margaret, your story honors your grandfather. Your video is sublime and serene! So very glad you had the chance to see the wild horses of North Carolina again and walk in fields of gold. Thanks Mary. He is the best and follows my blog too, which is really cool. So glad you enjoyed it, and I was able to share my adventure. You just brought a tear to my eye… I, too, used to have a horse…what you have said is so true! I now paint them, sometimes… and the eye, if painted correctly is the soul of the painting and I can see it come to life before my eyes. Thanks so much for posting this! Ah – thanks Anita! I really appreciate that. That’s awesome that you paint them. So cool! absolutely beautiful 🙂 so touching!!! Thanks so much! Sure – great website! Nice and clean design. That mug brownie looks awesome too!! This post made me happy to even read it. Thank you for sharing them with us! You are very welcome. Thanks so much for taking the time to read it and post a comment. They sure are. Great souls! These horses are emblematic of the greater, lost America. Very true. They are just so free and majestic. It is quite an experience to get to stand where they stand. Thanks so much for reading and commenting. They are such great animals. True – maybe one day. I hope. But until then enjoy them as much as you can. Breathtaking video, and magnificent photos. Your story is touching, and I feel very moved after reading all the way through. I will definitely be back for more. Thank you for sharing! Oh, and congrats on being Freshly Pressed! So glad you enjoyed the video and blog. Keep in touch! Thanks so much – I’m so thrilled to be recognized by Freshly Pressed. Amazing. Horses are such free spirits. I have a friend who does release therapy for horses with problems caused by fear or bad experiences. He tells me of amazing stories of how he sees/feels the free spirit return when the horse is released from what caused its ailment. he now runs courses around the world. If you want to know more contact me through my website. keep up the good work I think it is awesome. Ian – that’s so neat. What great work. And that means a lot. Will do. Keep in touch! Fantastic post ,bring back sweet memories.Regards. My heart was racing just reading your post! What an incredible experience for you, for anyone able to be there. Horses have always been in my dreams, day dreams, night dreams, longing dreams. I love everything about them and always have. You did a great job capturing their spirit in photo’s. I can’t tell you how much it made my day. Ah – I really appreciate that. So glad you liked it. Hope you can see them some day. They are amazing animals. So true. Just priceless. Thanks a lot! Thank you for such a heartfelt story. You are absolutely, right about their eyes – oh so very soulful, almost to the point of tears.!! You are very welcome. Thanks for reading it and commenting! So glad you enjoyed it. I know what you mean – they have much to tell. 🙂 – Yep – I was very lucky to have such an opportunity. Wow those are beautiful pictures! Thanks! I had great material to work with. Lovely and transporting. Gorgeous pictures! Thanks so much. Really glad you liked it! Beautiful photos. Beautiful post. Thank you for sharing your experience as only a fellow horse lover can. You are very welcome. Just a small tribute to some very great animals. Gorgeous….there is something so magical about horses to me and to see them wild? Amazing! 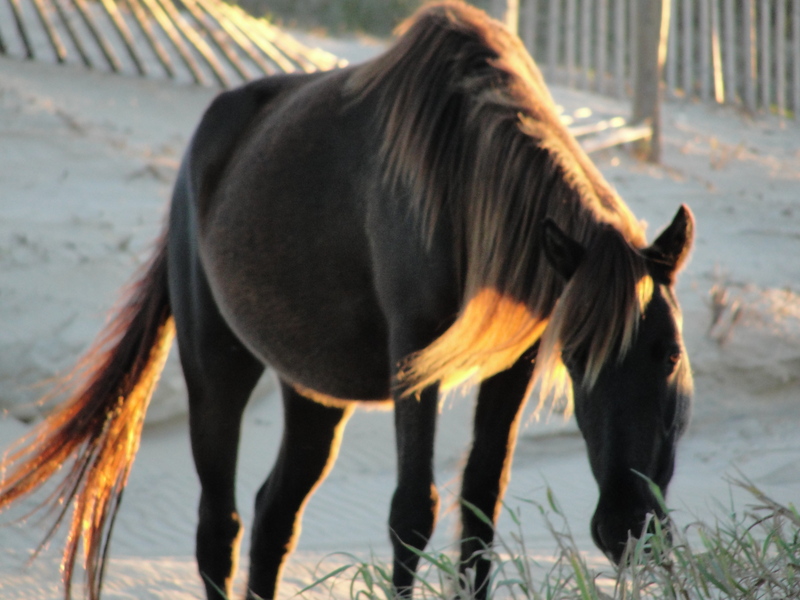 I hope to see wild horses in person one day….thank you for sharing! It truly is magical. I hope you’re able to make the journey one day to see them. It’s something you’ll never forget. Thanks for the reading and commenting! So lovely. I agree, there is just something about the way horses relate to us that brings out the best in us. Thanks! So true. They are inspiring! I used to vacation with family every summer at the OBX….brings back great memories 🙂 These shots are truly inspiring and beautifully taken! Ah – thanks so much. It really is a magical place. So glad you got to visit there. And how amazing was that!!!!! Ah – thanks so much! It really was such an incredible experience. You are very welcome. Thanks for the nice comment – so glad you enjoyed it! Love it! Love it! I can’t say enough. Love horses, though i never ride one. 🙂 Its amazing. Thanks so much! They are truly magnificent animals. You are very welcome! Thanks for reading and commenting! So great to read a blog by a fellow horse lover! This post absolutely made my morning, thank you for sharing your beautiful pictures and writing. 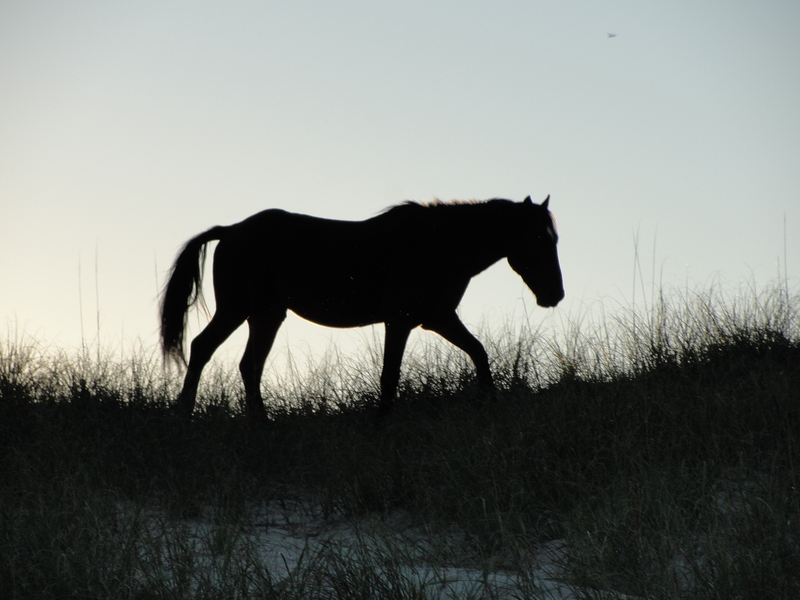 I’ve been lucky enough to see the wild horses of Corolla once while on vacation in NC, and I’ll never forget it. Though I never got to have a wild stallion approach me! What an experience that must have been! I’ve always been fascinated by wild horses, and I’d love to have a mustang one day. My first horse was a Quarter Horse, and he was best friend. Now my parents have an Appaloosa and a Thoroughbred. You’re right, there is something very special about their eyes. They do look into you. Like they can see who you are inside in a matter of seconds. So glad you’ve gotten to see them. It is such an amazing thing to witness. And so rare these days. Nice to meet another horse lover! It is a beautiful story 🙂 Great pictures and fun adventure. Wow, what an amazing experience. I’m incredibly jealous. I hope to one day own horses. For now, I grab what few and far between trail rides I can. 🙂 Thanks! I know – they are a lot of fun. Hope you get to ride often. Thanks a lot! So glad you liked it!! Beautiful pictures & a lovely video! 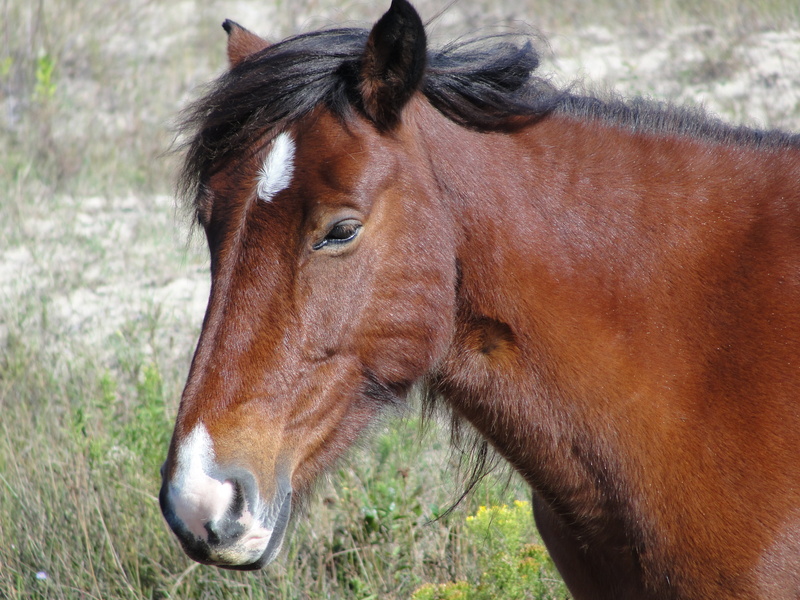 I never knew there were wild horses in North Carolina, but they are stunning. Thanks for sharing! Thanks very much! Yes – there are so many hidden treasures in NC. Really beautiful. I’ve stopped riding horses for a few months now, and all I wanted to do is be around one from that video. Thanks for sharing. Thanks for the kind words. I know – they are so majestic. Makes you never want to leave. Thanks so much for reading and commenting. So glad you’ve gotten to ride. It’s such fun! Hi Brooke! Thanks so much for the kind words. I checked out your blog. Love your paintings! You have quite a talent. Keep it up!